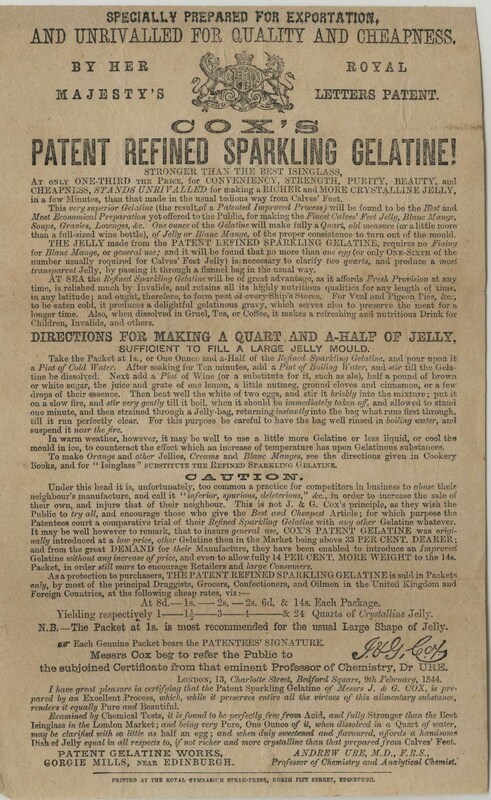 gelatin – What's Cookin' @ Special Collections?! A couple of weeks ago, one of my colleagues in the library showed up on my doorstep with an old advertisement. She picked it up, thinking I would want it for the culinary collection–as, of course, I did. After all, it featured one of my favorite obsessions and frequent blog topic: gelatin. Today, however, I won’t be subjecting you, dear Readers, to a list of terrifying recipes or a series of taunts at this wiggly food I just can’t bring myself to eat. Rather, I thought I would take an opportunity to write a post about following a trail and where it could lead someone. But first, Jell-O! This ad comes from 1921. Jell-O had, at that time, already been a commercially made product for 22 years (since it’s developer sold it to the Genesee Pure Foods Company). The original four flavors (strawberry, raspberry, lemon, and orange) were joined by cherry and peach, rounding out the six flavors advertised. Interestingly, during the 1910s and 1920s, Genesee Pure Foods Company flirted with a chocolate flavored gelatin (not a pudding or mousse mix), but it didn’t seem to have the popularity of fruit flavors and it was gone by 1927. By 1921, though, Jell-O was a household name in convenience, efficiency, and eating. For over 20 years, the company had been advertising in innovative ways, like giving away free little recipe booklets to tempt shoppers to try something new at home. As it turns out, this Jell-O ad had been neatly cut away from the back of a seed catalog, apparently as a collectible item. While the booklets are common collectibles and while the idea of cutting items out of other items isn’t new, I hadn’t quite seen it in action in this way. At times in our history, for example, people would excise pages from illuminated manuscripts to sell off piecemeal–but Jell-O ads? Anyway, following the trail: The seed catalog, as you can see, was for one Stark Bro’s. nursery. Stark Bro’s, like Jell-O, is a company not unheard of here in Special Collections. In fact, they are responsible for one of my favorite items on our shelves, which I’ve written about before. Although this particular page shows mostly flowers and a couple of tomatoes, Stark Bro’s were equally well-known for fruit trees–making this catalog a great venue for a product in which people were experimenting with, well, embedding fruit. This brings us to an important consideration for advertising: knowing your product(s) and knowing your audience. You don’t always see advertisements for non-seed catalog products in seed catalogs. But, if you’re going to bring in outsiders, make it something that matches up! Welcome to Women’s History Month 2016! As with previous years, this month we’ve got a whole new series of profiles lined up. But first, a quick message from our sponsors–Us! You can read about the 1917 edition of Ryzon Baking Book: A Practical Manual for the Preparation of Food Requiring Baking Powder in a previous blog post and you can view the 1914 edition of The Story of Crisco on the Special Collections digital collections website. “The Minute Man Cook Book.” 1909. [Alternate title: “The Minute Man A Brief Account of the Battles of Lexington and Concord by Wayne Whipple with Recipes for Minute Tapioca, Minute Gelatine (Plain) and Minute Gelatine (Flavored) by Janet McKenzie Hill, Marion H. Neil, Ella A. Pierce, and other culinary authorities.”] In the Culinary Pamphlet Collection, Ms2011-002. Alcono Cook Book. Newark, N.Y., J.M. Pitkin & Co., 1910. “The Story of Crisco: 250 Tested Recipes.” 1913. In the Culinary Pamphlet Collection, Ms2011-002. Delicious Recipes Made with Mueller’s Products. Jersey City, N.J. : C.F. Mueller Co., 1914. A Calendar of Dinners with 615 Recipes: Including the Story of Crisco.8th ed. Cincinnati : Proctor & Gamble Co., c1915. Dromedary War-Time Recipes: Appetizing and Economical Dishes Made with Dromedary Food Products. [New York? ]: Hills Bros. Co., 1917. Good Things to Eat: A Selection of Unusual Recipes for Those who Appreciate Good Things to Eat. San Francisco, Calif.: California Packing Corp., 1917. Economical Cookery. Boston: Little, Brown, and Company, 1918. Sixty-Five Delicious Dishes Made with Bread: Containing Tested Recipes Compiled for the Fleischmann Co. New York: Fleischmann Co., 1919. Auto Vacuum Ice Cream Freezer Recipes. New York: Auto Vacuum Freezer Co., 1920. A Modern Manual of Cooking. Cincinnati, Procter & Gamble Co., 1921. “Mrs. Harland’s Cooking Secrets.” [Crisco.] 1925. In the Culinary Pamphlet Collection, Ms2011-002. Neil also published in Table Talk, a long running home economics and cooking periodical, and wrote or edited numerous other pamphlets and ephemeral publications that aren’t likely captured by catalog records. I’ll also mention that many of the publications above (and the others) are available online through the Internet Archive, HathiTrust, and/or Google Books. You’ll just have to go looking for them! With an extra Thursday this March, you can expect four more profiles, and I promise, they won’t all be about women of the food world shrouded in quite so many shadows. For now, you’ll just have to let Marion’s recipes speak for her. Unfortunately, I don’t have any hints as to when these advertisements were created. I know that the company was active in at least the first four decades of the 20th century, but it could have slightly earlier roots, too. Between the 1910s and the 1940s, much like Genessee Pure Foods Co. (later Jell-O Company and General Foods Corporation–Jell-O Division) and Chas. B. Knox Co., this company produced LOTS of small pamphlets with recipes. J. & G. Cox even published at least one pamphlet in French, as well: “Recettes choisies, Cox’s instant powdered gelatine.” I found two copies cataloged by universities in Canada. Lest we forget, gelatin was not an exclusively American product. Until it was commercially available in the late 19th century, it was made at home, by housewives everywhere. The advertisement on the more orange colored paper is the one with recipes. It’s also the one that appears to have been marketed for American audiences. It has a small “U. 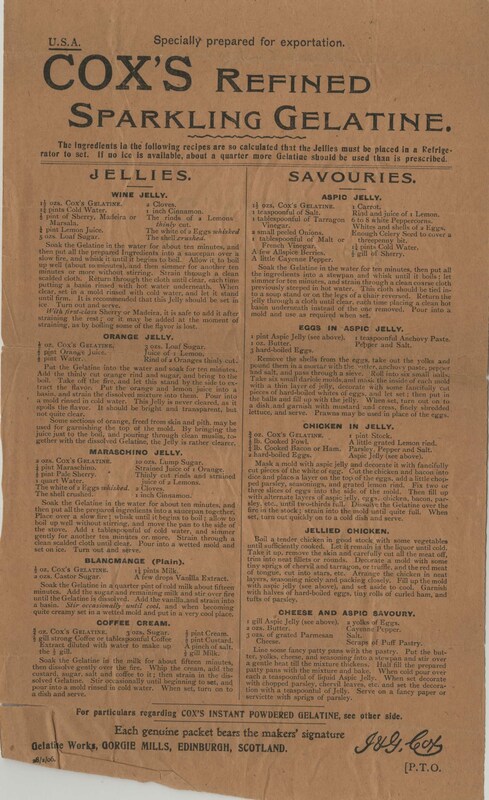 S. A.” in the upper left corner and is labeled “specially prepared for exportation.” Yet, the recipes are clearly in British English and have a certain air of British cuisine about them. 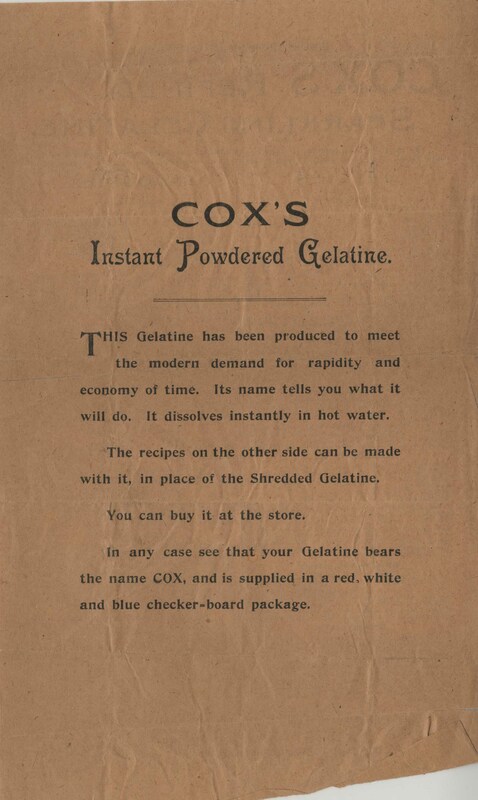 The other advertisement is more of a single-page essay praising the quality, benefits, and low cost of the Cox’s gelatine. It even includes a testimonial from a chemist. However, both make a reference to it being prepared for export, suggesting J. & G. Cox’s market may have been broad. Both ads are a little different from the pamphlet-type items gelatin companies also produced and gave away. And while these two ads do stand out a little more because of it, the audience and the intention was the same: selling product to consumers, whichever side of the Atlantic they were on.